When it comes to a free DVD ripper for Mac with decryption ability, Mac The Ripper is absolutely second to none. For decades, the freeware has been unanimously acknowledged for its great functionality to rip DVD to hard drive, regardless of DVD encryption. However, like many freeware, it still fails to free itself from the stingy clutches of thick-skulled renewal, resulting in constant complaints from customers, with the most typical one being Mac OS support. So each time Mac users update their OS like the Mac10.10 Yosemite announced at WWDC 2014, they will suffer from OS incompatibility as there is no MacTheRipper available for Yosemite. Does this mean you cannot freely rip DVD on Mac OS 10.10 for on-the-move watching? Absolutely no. There are still many alternatives to accomplish the DVD ripping task. Among the massive Mac The Ripper alternatives, here I humbly recommend MacX DVD Ripper Pro, which is destined to stand out from other similar DVD ripper for Mac software, attributing to its unquestionable DVD decrypting ability and constant update. No matter the latest DVD movies published by Disney, Sony, Warner Bros or the ISO images can be decrypted and ripped on Mac OS Lion, Mountain Lion, Mavericks and Yosemite flawlessly. 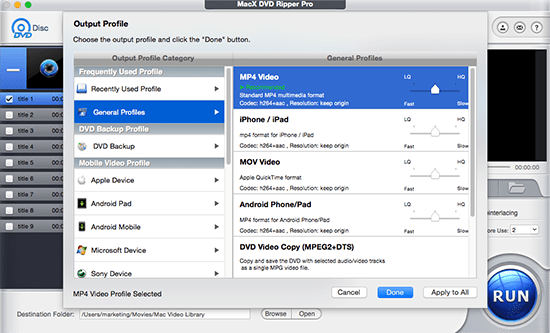 Below are the specific reasons why the DVD ripper for Mac Yosemite is superior to MTR. Why It is the Best Mac The Ripper for Yosemite El Capitan Replacement? The following table will show you how the alternative MacTheRipper Yosemite/El Capitan is more exceptional than MacTheRipper. (Parameter settings: adjust resolution, bit rate, frame rate, etc. The tablet listed above gives you a clear clue about the two Mac DVD ripper programs. With more output formats and devices supported, constant OS update, excellent edit feature and more, MacX DVD Ripper Pro is for sure the best Mac The Ripper for Yosemite replacement. If you are ready to take it for a try, just following the steps below to experience its flawless DVD ripping task on your Yosemite, even El Capitan. Free download MacTheRipper alternative for Yosemite El Capitan, click "DVD Disc" or "DVD Path" button to import the DVD on your Mac OS 10.10. Select the output format as you want. With the help of best DVD ripper for Mac, you can easily rip DVD to the video formats you desire like DVD to MP4, MOV, iTune, iMovie, iPhone, iPad, Android, etc. Click the "RUN" button to start ripping DVD on Mac 10.10 or 10.11 with the MacTheRipper Yosemite alternative. This article is about the tutorial of how to use MacTheRipper to decrypt DVD and shows you an alternative to put DVD on your fashionable iPad, iPhone or iPod on Mac computer. The best DVD rippers for Mac and PC are shared with reviews and detailed comparison; copy and rip encrypted DVD to MP4, MOV, AVI, MPEG4, MKV, iPhone, iPad with the best DVD ripper. MTR won't work on Mavericks? Here is the best alterantive that can rip DVD on Mac Mavericks, including the latest El Capitan and macOS Sierra.